Weight is 10.5lbs with yoke and barn doors. As Cameras progress to 4K and beyond, lighting with perfect colour reproduction becomes supremely important. 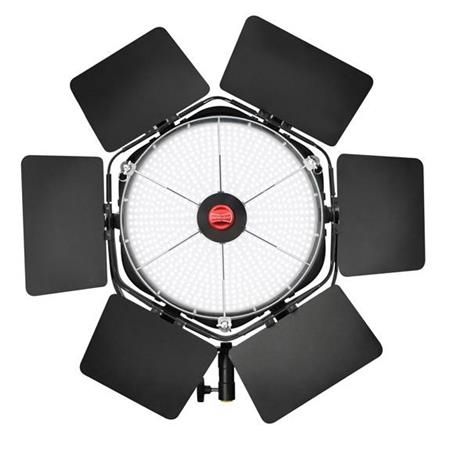 To meet this criteria, Rotolight have developed an LED Colour phosphor technology called Accucolour. Developed at Pinewood Studios, for the most demanding of professionals. ANOVA PRO's Bi-Colour LED system with AccuColour technology delivers exceptional colour rendering CRI>96, with skin tones R15 > 99. ANOVA also includes an accurate colour temperature display (CCT). The soft-light output from ANOVA still reveals crisp skin detail when the light is used for portraiture or interviews, and ANOVA produces that Rotolight signature "Ring-Light" Effect, perfect for artistic "Rembrandt Style" lighting.